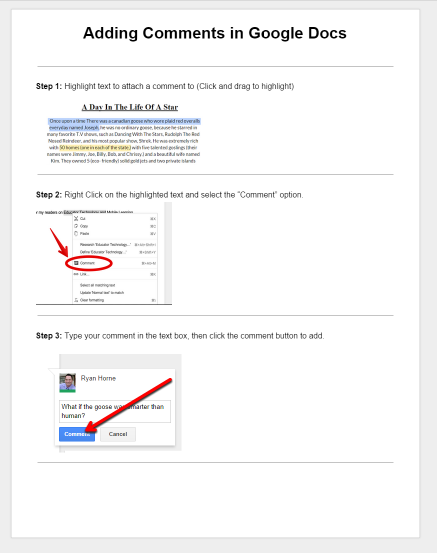 Today, we will learn how to collaborate digitally with our classmates by using the "comment" feature in Google Docs. First we will share our own Google document with the other students in our small groups. Next, we will find the documents other students shared with us, and then we will add at least two helpful "revision" comments to each document. Students have left at least 2 comments of feedback ideas to improve writing on each of their group member's Google Docs. Students have replied to at least 3 of the comments left on their own Doc. 4 points - At least 2 "revision" comments on other Doc's and replied to at least 3 comments on their own Docs. 3 points - Less than two "revision" comments and replied to less than 3 comments.